Hello there blog. Sorry it’s been a while. But now it’s May and the sun is shining and I think I should see if my brain links to my typing fingers for more than 140 characters. What news in the Vicarage? 1. I gave some talks to people I’d not met before, which was a first for me. The lovely spouses of Sheffield Diocese asked me to speak to them on Messy Ministry and so I spent last Saturday talking to them and encouraging them to talk to each other about the messy and peculiar world of Vicarage life. I was very much encouraged to meet them and hear of God’s work in Yorkshire. I also got to drive past the church where my parents were married, as the venue we were using was just close to the village where my Yorkshire grandparents used to live. 2. The Ministry of a Messy House is available in German now. I have a copy of Herrlich Unperfekt but my schoolgirl German isn’t quite up to reading it. They even translated my dad’s poem. 3. The book in English is currently being reprinted by IVP, as they are out of stock in the warehouse. There should be another 500 copies available at the end of May. See if you can find one at your local Christian bookshop in the meantime. 4. I have cleared my desk. This momentous achievement means that my head feels a little less messy. Maybe I’ll even start writing things again. Although it’s amazing how attractive housework becomes once there’s something else that you feel you should be doing instead. This morning I clicked through to read the Advent thought from my publisher. And guess whose book it came from? Happy First Monday of Advent everyone! A friend tagged me last night on Facebook with this picture of her copy of The Ministry of a Messy House. It took her a while to find it on the table. Looks almost identical to our hall table. 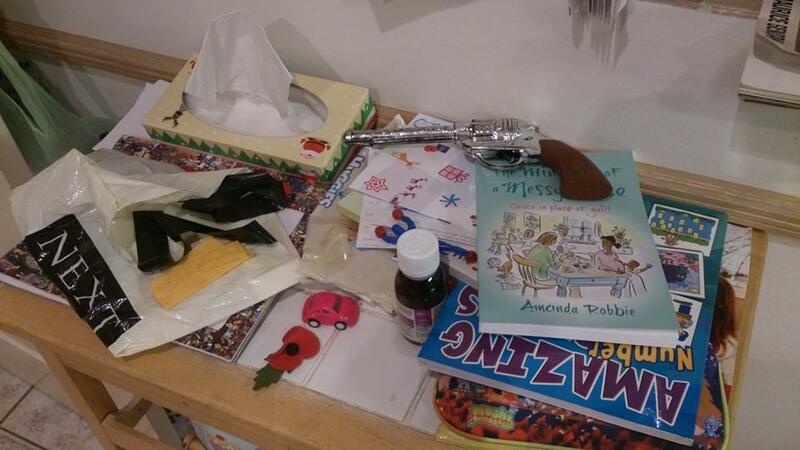 Although I think there’s a miniature Amy Pond figure there rather than a toy gun. I’m sure there’s some great ministry going on in her house.